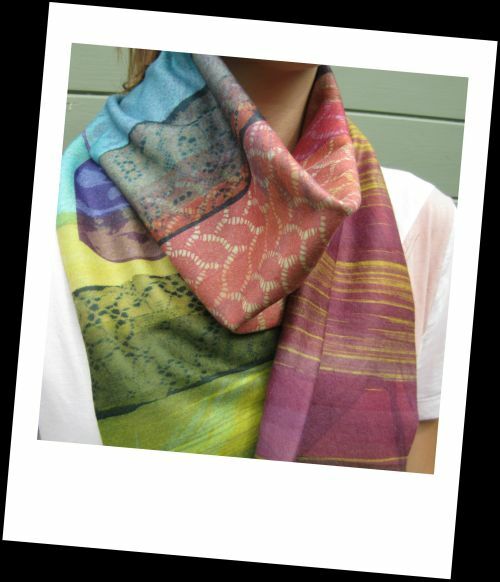 The heat sublimation workshops are designed to help you explore colours, textures, inks and new techniques in which you can use to create a printed scarf, piece of fabric or paper sketch book. The day is playful and makes a wonderful gift for those who enjoy arts and crafts in a warm and welcoming environment. A brief outline of what to expect on the day of the workshop. The morning session will be from 10-12.30. You will explore colour and how putting 2 colours together can sometimes create a third… but with transfer inks the colours are not always what you would expect! We will play with texture and the use of simple stencil techniques, wax crayons and mark making. We will break for one hour for lunch. The afternoon will give us a chance to reflect on what you have learnt in the morning, and how to put these ideas and processes into a design that can be made into a scarf. This is not compulsory; you may wish to just explore the heat transfer process creating swatches for a sketchbook using paper as well as fabrics. These papers can make beautiful cards. Be sure to bring an apron and rubber gloves with you. The classes are small with a maximum of 4 students, so place a £20 deposit today to secure your place. Due to such small numbers in the class, all workshops are non-refundable when booked. Preferred payment is cheque but if you have special requirements please discuss this with me personally. The price includes all materials used on the day, with a large piece of fabric designed by you that can later be made into a scarf. Gift vouchers are now available and can be redeemed as full or part payment for my workshops. The vouchers are designed to be personalised to fulfil the wishes of the purchaser and recipient, so if you have a special focus in mind for the day be sure to let me know beforehand! thank you for a fantastic workshop day. What I especially liked about the day was the fact that it was so hands on - lots of opportunity to try different the effects that wax rubbings, stencils and layering can lead to when printed up onto the fabric. Expert guidance from you! Very satisfying to take away my very own piece of printed fabric - felt like quite the designer! I spent a fabulous day at Katy's doing my own design using the Heat Transfer printing method. I thoroughly enjoyed it. Great teaching from Katy, she gives you great ideas, but then guides and inspires you lets you create your own designs, which even I managed!